The Twelve Apostles Hotel and Spa is a few minutes from the famous beaches at Camps Bay and close to Cape Town and its many attractions. The hotel operates regular shuttles to both the beach and the Victoria and Alfred Waterfront making it equally easy to spend a day by the sea and time in the centre of Cape Town. If you want to splash out take a helicopter transfer to the city centre and enjoy fabulous views views of the peninsula en-route. The hotel is a destination in itself, with a superb spa, lovely gardens, outdoor pools and even a small cinema! A wide range of outdoor pursuits, watersports and adrenalin activities are available in the neighbourhood and staff are happy to help you plan your stay. The Azure Restaurant is an elegant eating place with picture windows and ocean views, and a terrace for outdoor dining. Here you can enjoy gournet cuisine paired with fine wines in refined surroundings. The Cafe Grill offers relaxed dining round-the-clock, and The Conservatory is the venue for delicious afternoon teas complete with finger sandwiches, scones and cakes. The Leopard Bar is a great place to enjoy a cocktail at sundown and mix with other guests. There are several categories of rooms and suites. All provide spacious, tastefully decorated accommodation, with modern en-suite bathrooms, individual climate control, an integrated entertainment system and complimentary Wi-Fi. From your private balcony or patio you have wonderful views of the mountains or ocean, and there's 24 hour room service. The hotel weclomes families and special activities can be arranged for youngsters including wildlife excursions, nature walks, park and farm visits and screenings of child-friendly films in the cinema. 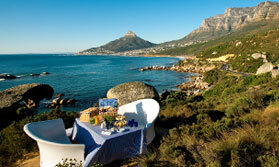 The Twelve Apostles is part of the family-run Red Carnation Hotel Collection. Open: The Twelve Apostles Hotel and Spa is open all year. Location: The hotel is on a cliff overlooking the Atlantic Ocean. It is 10 minutes from Camps Bay and a short drive from central Cape Town. Rooms: There are 55 guest rooms and 15 suites with private balconies and terraces overlooking either the sea or the mountains. All have air conditioning/heating, TV and DVD player, safe, free Wi-Fi internet access, and en-suite bathroom. Bathrobes, slippers, toiletries, hairdryers and bottled mineral water are provided. Rooms have either a balcony or terrace. Suites also have minibars, tea and coffee makers and an iPod dock. There is round the clock room service. Activities: You can go walking in the gardens maybe taking a picnic with you, and go hiking, mountain biking and jogging near the hotel, and using the ‘sports buddy’ programme you can be accompanied by a member if staff if you want some company. Yoga mats are available for guest use. There are squash and golf facilities nearby, pay locally. The hotel operates shuttle services to the beaches at Camps Bay and to the V&A Waterfront in the city for sightseeing, shopping and visiting entertainment venues. The hotel also offers helicopter transfers to the V&A Waterfront. Staff can arrange various activities such as whale and dolphin watching trips, kayaking, caving, surfing, kitesurfing, ziplining and skydiving. Facilities: These include a well-equipped spa offering a wide choice of treatments and with indoor and outdoor rooms, hydrotherapy pools, steam room and health bar. There’s a private 16-seat cinema with regular film showings and available for private hire. There’s a choice of dining venues (see below). The Leopard Bar serves soft and alcoholic drinks, as well as afternoon teas, and is popular with locals as well as guests. The hotel has gardens with hammocks, sun loungers, a heated rim-flow pool, a rock pool and Jacuzzi. Dining: Azure Restaurant serves a la carte meals. The Café Grill is a more casual venue serving light meals and snacks plus a selection of fruits and ice creams in summer. It is open 24 hours a day. The Conservatory is open for afternoon tea and private meals. Children: Children of all ages are welcome. Children under 12 stay free when sharing with 2 adults. Gift bags are available for young children. Cots and prams can be provided. Child minders are available. Films suitable for children are screen in the cinema most afternoons. Notes: The Twelve Apostles is a member of the Leading Hotels of the World group. "great hotel and location. loved the rooms overlooking the sea. The main restaurant , however was average and the service was poor. Whereas he service in the bar and the bistro was very good. only disappointing aspect, is that I left all my camera chargers and leads in the room, in a large bag.I rang the next day..got a very poor response from the reception, said they'd ring me back but I had to ring only to be to be told they were not found. I was very surprised to hear this."